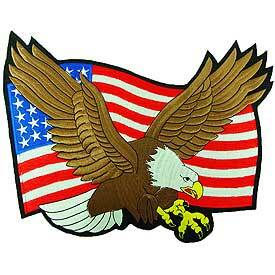 This American flag/bald eagle patch measures a full 12 inches across. When people think of embroidered patches, what comes to mind is something a couple inches square, usually sewn on a shoulder or pocket. But advances in embroidery design and production technology have allowed manufacturers to create embroidered works of art up to 20 inches wide, a stitching canvas with virtually unlimited possibilities. One of the most popular large designs is the U.S. flag, creating a vibrant image that is often sewn on to the back of a jacket by motorcycle enthusiasts. Motorcycle clubs are also large consumers of custom-designed oversize patches, with logo patches detailing the club and its geographic location. Companies use large embroidered patches on the back of employee uniforms. 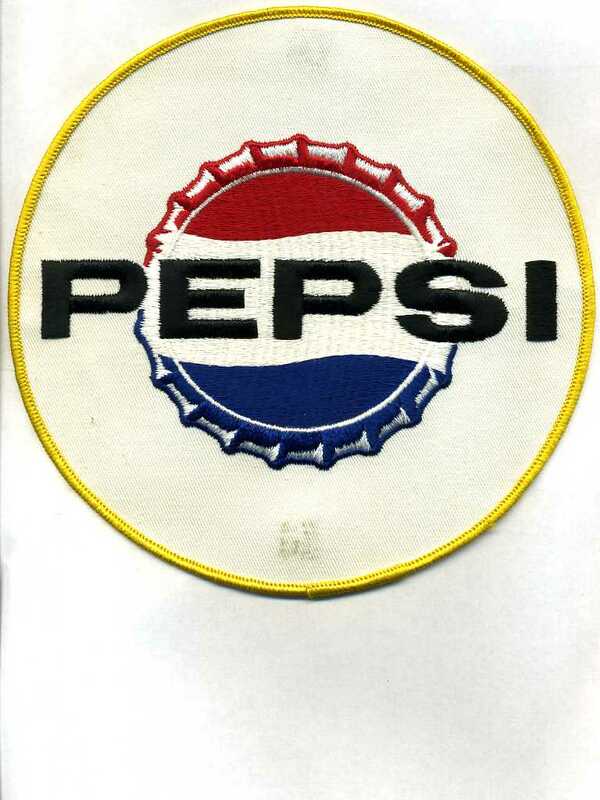 This retro Pepsi patch is actually one foot wide. Large patches are designed for high visibility, even from a distance. Corporations with products to sell have used oversize embroidered patches as a promotional tool. 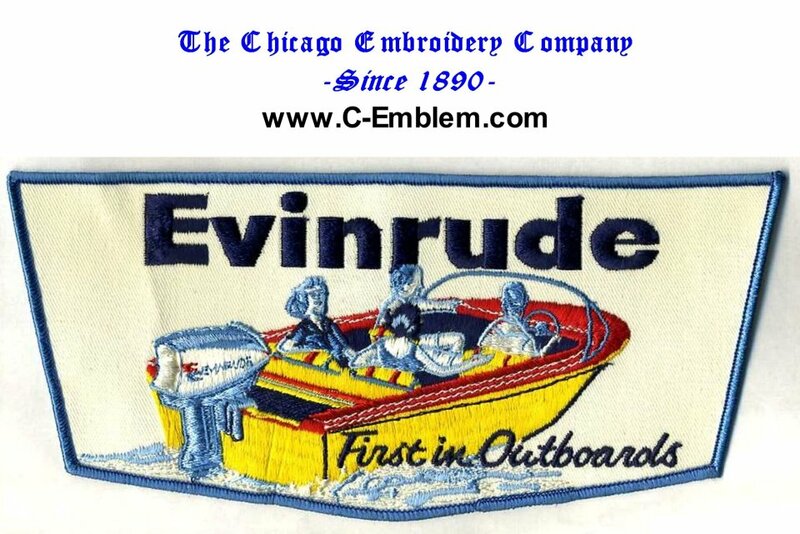 The Chicago Embroidery Company created a unique design for Evinrude, the venerable manufacturer of outboard motors for fishing and pleasure craft. 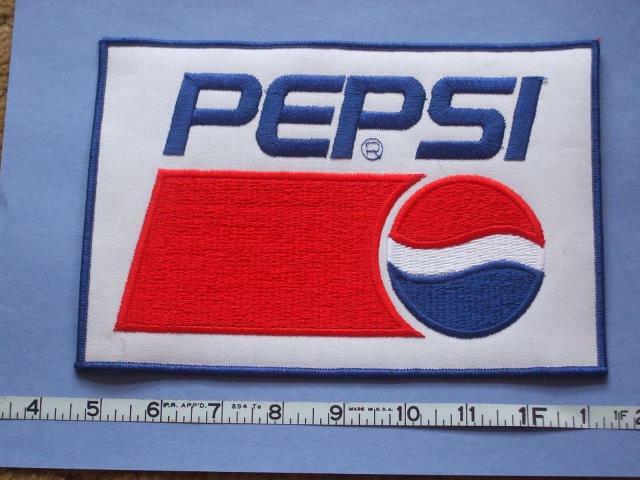 Patches made for Pepsi measured 12 inches across and were designed to be worn across the back of delivery truck driver uniforms. But not all large patches are worn on the back of shirts or coats. Hockey players often sport a large patch with the team’s crest on the front of their uniforms. The Chicago Embroidery Company has worked with many hockey teams over the years to create a unique look for players. 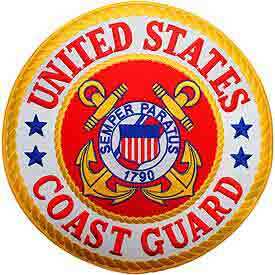 The United States Coast Guard uses large patches to improve the visibility and identity of crew personnel. Any patch bigger than 10 inches across is considered oversized. Due to limits of embroidered patch machinery, 20 inches across is the practical size limit for creating an embroidered emblem. Large patches cost more because it takes more machine time and operator time to make. They also use more material but the labor cost usually exceeds the material cost. Large patches can be more cost-effective than direct embroidery because they can employ material as part of the design, which cuts down on the stitching time. White or a vibrant color of backing material enhances the look of an oversized patch. Another advantage of large patches over direct embroidery is that they can also be transferred to another use after a garment or uniform is outgrown, irrevocably stained or worn out. As fashion trends periodically go retro, large patches are coming back in style. For more information about ordering embroidered patches, large or small, for your organization, or to get a quote, contact the Chicago Embroidery Company at www.c-emblem.com or call 312/644-4232. 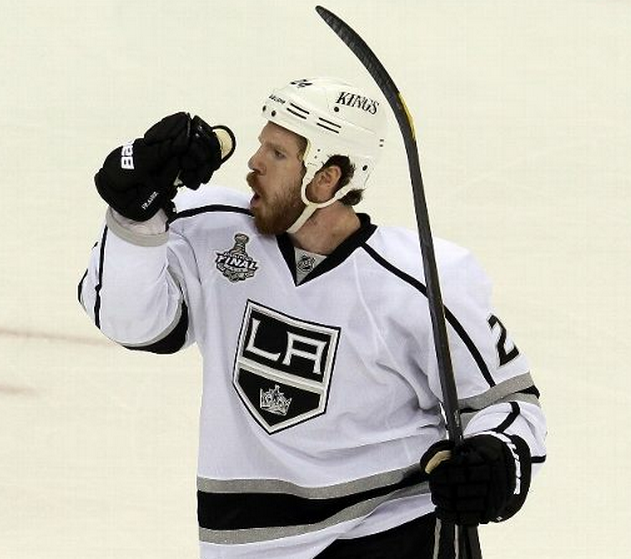 Players in the NHL championship wear a Stanley Cup Finals embroidered patch on the right front shoulder of their sweaters. As the battle for the 2013 NHL championship begins, players on the two teams competing in the series will be wearing jerseys featuring a Stanley Cup Finals patch on the right front shoulder. The Stanley Cup, one of the most unique trophies in all of professional sports, has been featured in a number of embroidered patches over the years. NHL jerseys, or “sweaters” to hard-core hockey aficionados, featuring this patch are more valuable to fans. Fans hope the Stanley Cup Finals patch can be replaced with a championship patch for their respective team. 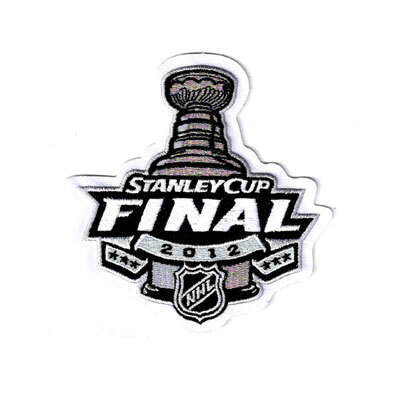 The NHL Finals patch worn by the players features an image of the Stanley Cup trophy. Designs for the Stanley Cup patch have been standardized over the past few years, and any patch featuring the image of Lord Stanley’s Cup (the trophy is named for Lord Stanley of Preston, the Governor-General of Canada in 1892 and a strong supporter of amateur hockey) is licensed by the National Hockey League. A number of unauthorized patches are sure to be created when a team wins the coveted trophy, but true fans want a patch with the distinctive stepped conical image of the Cup. This patch commemorates the 100th anniversary of the Stanley Cup. 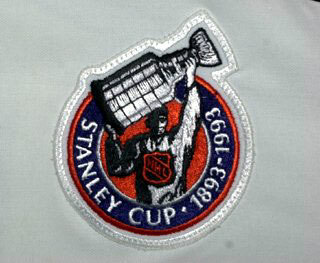 A 100th anniversary Stanley Cup patch was produced for the centennial of the cup in 1992. 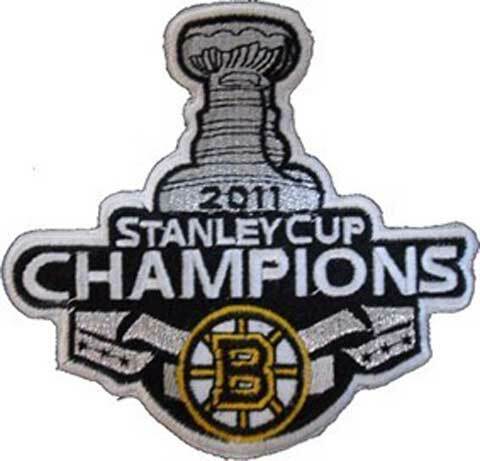 The 2011-112 Boston Bruins had their own Stanley Cup championship patch. 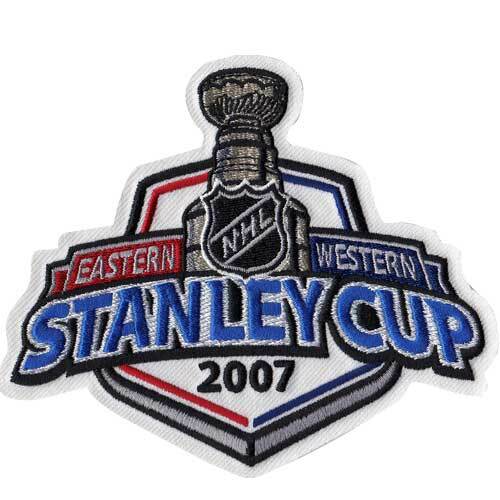 Any piece of clothing, shirts, jackets, sweaters, hats or more, is sure to command a better price, both now and in the future collectables market, if it features an embroidered Stanley Cup Finals or, better yet, a Stanley Cup Champions embroidered patch. This value makes the patches a tempting target for purveyors of fakes. Buyers of embroidered patches or fan gear should carefully inspect the patch for signs of quality stitching workmanship, sharpness of design and regulation size. Unscrupulous purveyors of counterfeit merchandise will often advertise a patch that is really much smaller than normal size. Older Stanley Cup patches are prized by fans. The Chicago Embroidery Company has been making hockey patches since the 1950’s and has made more than 10,000 Chicago Blackhawk chest patches alone. Learn more about how the Chicago Embroidery Company can create custom embroidered patches for your hockey team or any organization by visiting our website, www.c-emblem.com or by calling 312/644-4232. 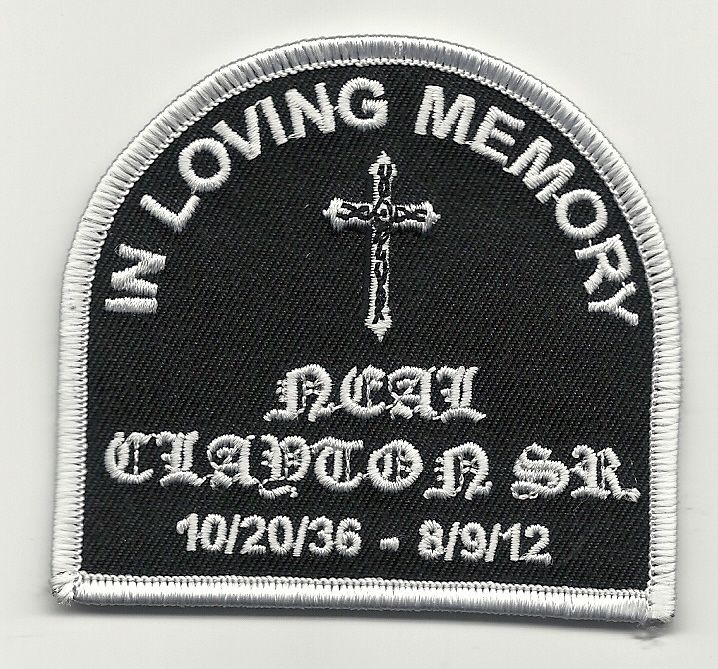 Many motorcycle clubs honor the memory of a deceased member by wearing a custom-made embroidered patch. 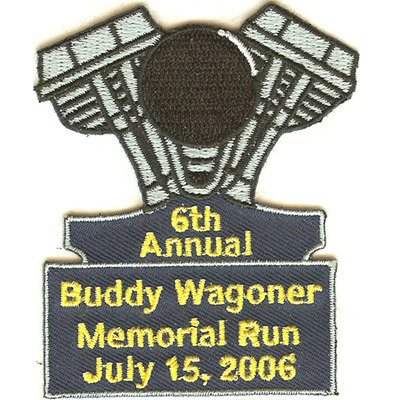 a unique way has developed to remember fellow enthusiasts who have died -– a commemorative embroidered patch. This memorial patch features a unique die-cut motorcycle design. 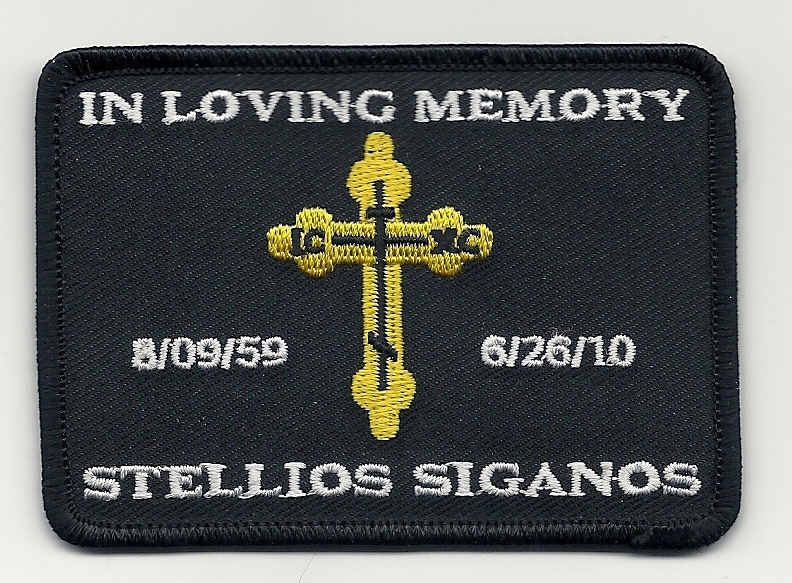 memorial patches are also sewn on jackets, hats, shirts and other riding apparel. Displaying the patch is a permanent reminder of the missing rider and a unique form of respect and feeling that the deceased individual is still “with” the club on the road. His spirit rides on. Memorial patches are not just used by bike clubs. Memorial patches can be as simple as a member or teammate’s initials. Intricate multi-color designs are also popular. The Chicago Embroidery Company has made them for little league teams, soccer teams and other groups that want to commemorate a teammate or member who is no longer with us. 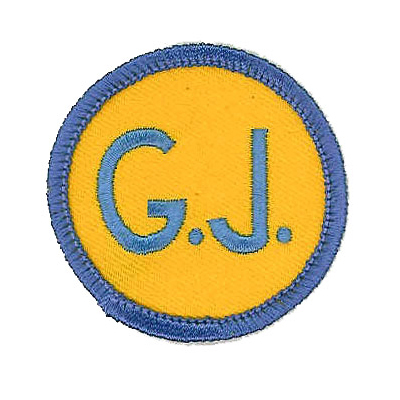 The patch is often displayed on the sleeve of the team’s uniform with the season dedicated to their comrade. A wide variety of designs can be incorporated into a memorial patch. Chicago Embroidery Co. offers free design assistance to help you create a loving commemrative tribute. can be purchased in small lots of just a dozen or in bulk of a hundred or more. The Chicago Embroidery Company has worked with motorcycle clubs around the country to create a handsome embroidered patch that honors the memory of the rider in a special way. For more information about ordering embroidered patches or to get a quote, contact Chicago Embroidery Company at http://www.c-emblem.com or call 312/644-4232.